Also, look at the great white board dragon sign I had waiting for me. On this trip, I spoke about my books and writing at two schools – Westmoore and West End, and had an afternoon event at the bookshop. What a great time I had! 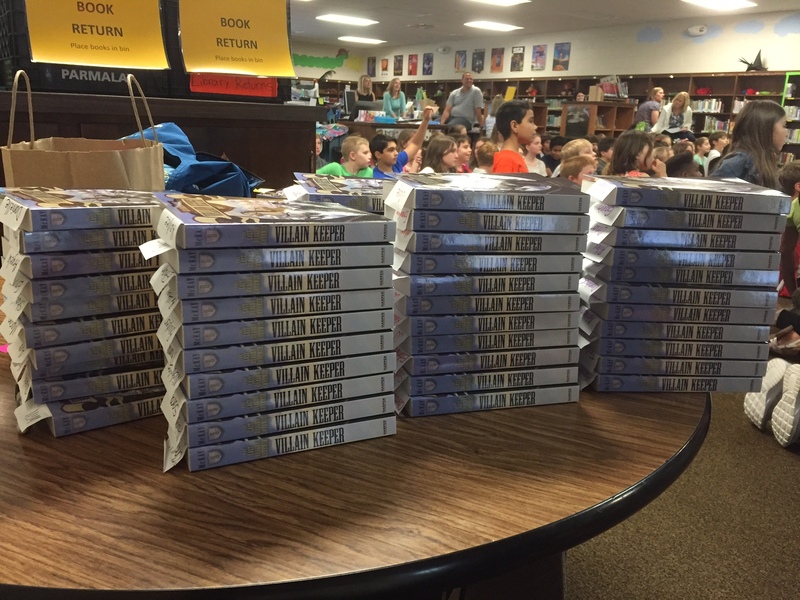 And look at all the books I got to give out to students. I had a lot of fun. At Westmoore it was hat day, so if you squint you can see lots of hats going on in the pic. I wish I had known. I would have loved a good reason to wear a hat! It’s really nice to share my book with readers, and sharing about it near where I grew up is certainly special. 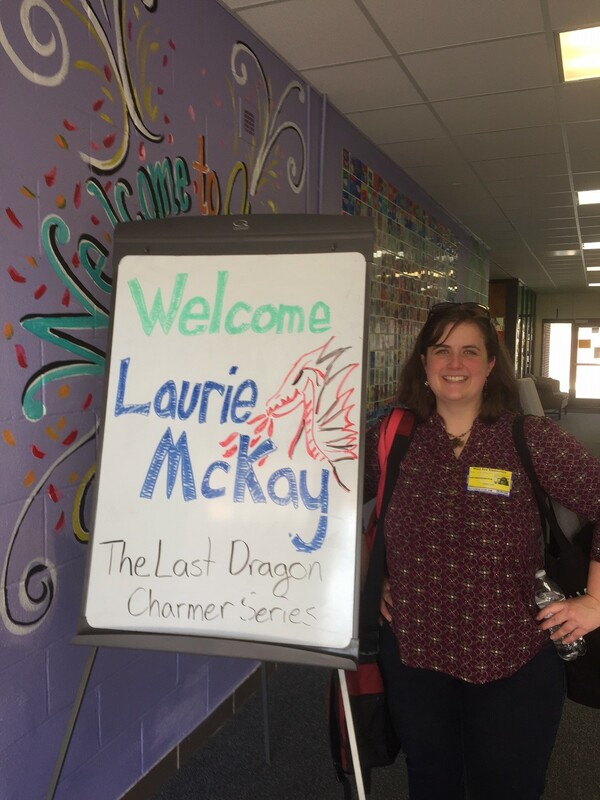 Last Wednesday I visited Asheville, NC, the setting of The Last Dragon Charmer series and home to fantastic local bookstores. 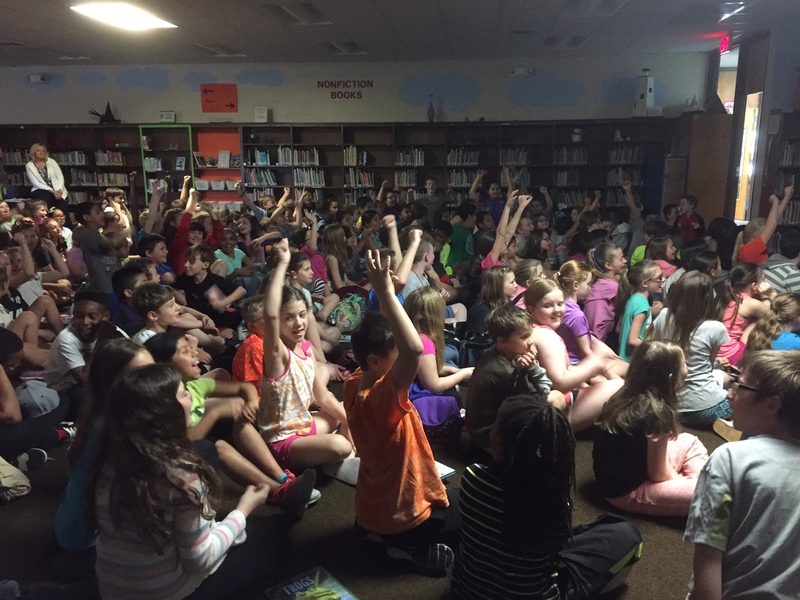 I partnered with the magical Spellbound Children’s Bookshop for an author visit at Hall Fletcher Elementary, and I have to thank Spellbound and the school and students for a warm welcome. 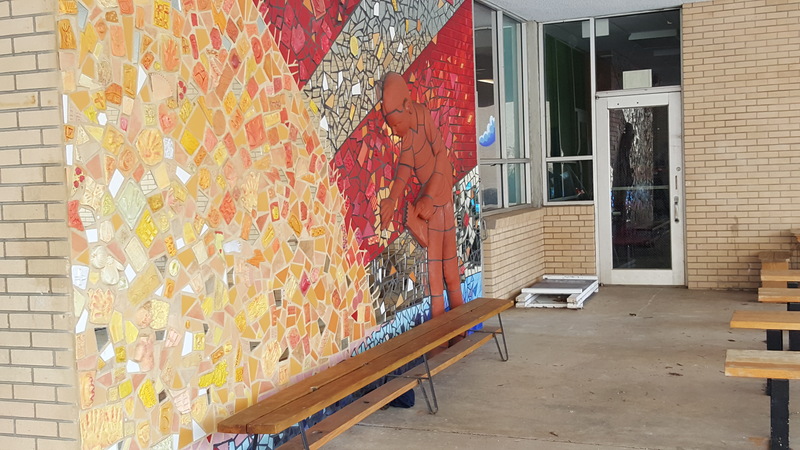 I have to mention, Hall Fletcher has a great media center and beautiful murals on the school. The shine like sun rays. 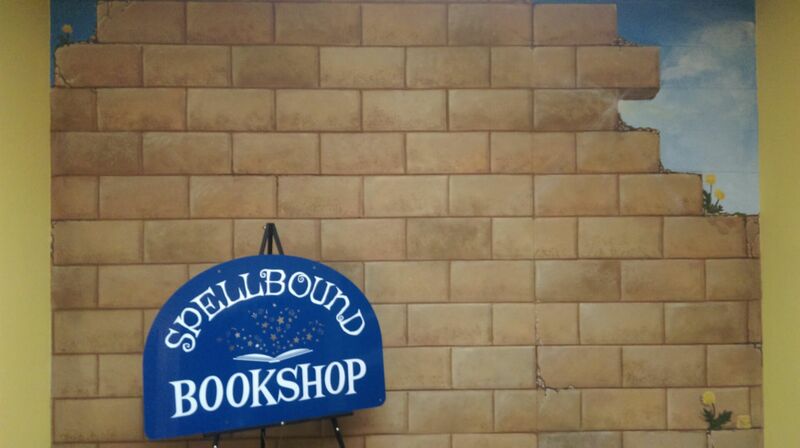 Spellbound’s new location is at 640 Merrimon Ave. There is a large new book area and a great classroom and used book room as well. (And the shop is just above The Hop ice cream shop. Did I mention at the store event there was a delicious ice cream cake? Well, they’re was. Of course, I also had to buy a few books while I was there. I got an autographed copy of Sound by Alexandra Duncan and two great books for my niece and nephew. Spellbound’s new shop is great! I had a wonderful time, met some wonderful people, and got some great books. Check out the new shop if you’re in Asheville. 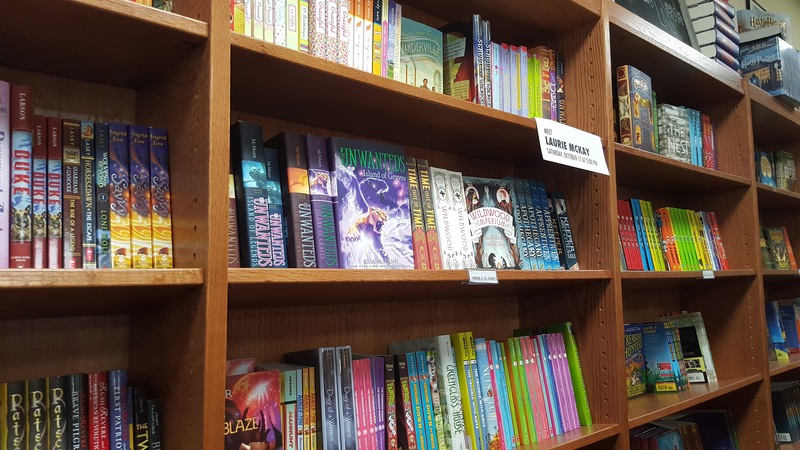 Not only are there great books but they also have cool events for kids and teens. 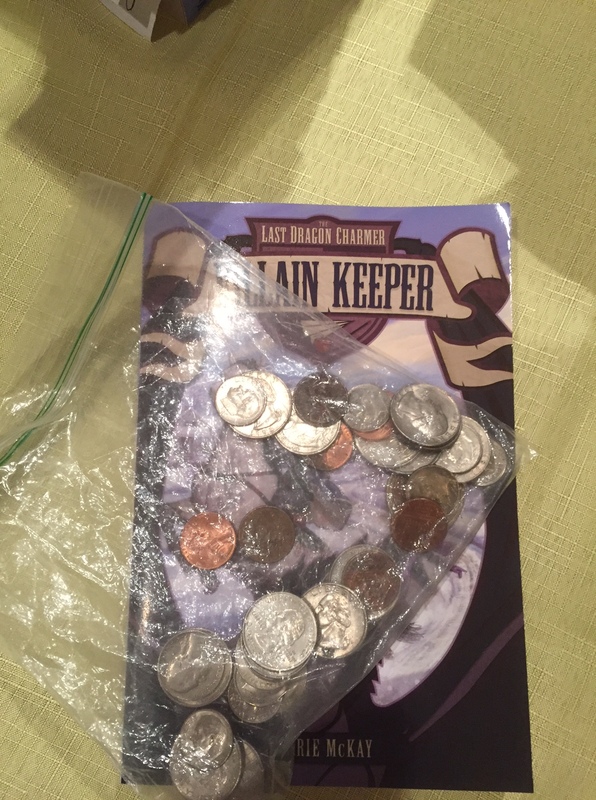 And, I lest I forget, there are also autographed copies of VILLAIN KEEPER and QUEST MAKER available. 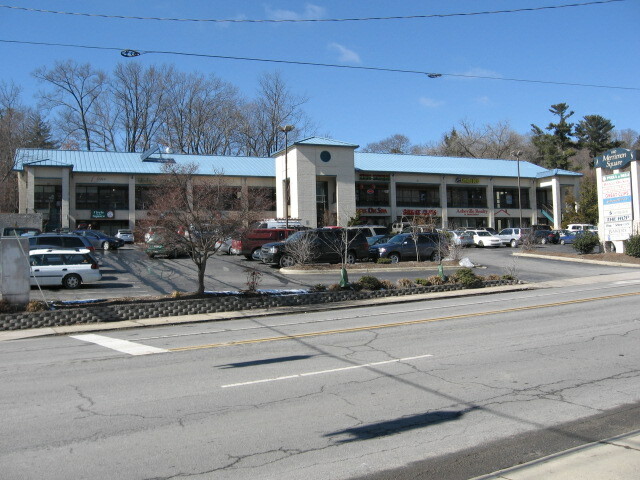 I visited The Fountainhead Bookstore (soon to be renamed Novels and Novelties) in Hendersonville, NC on Monday. (Okay the picture below is from an earlier visit on a sunnier day.) Monday it rained and rained. Despite the weather, the visit was great. I always feel welcome in Hendersonville and the bookstore is full of books and charm. I did a store event, a podcast with local author Ken Butcher, and later met for a delicious dinner with the tween book club. 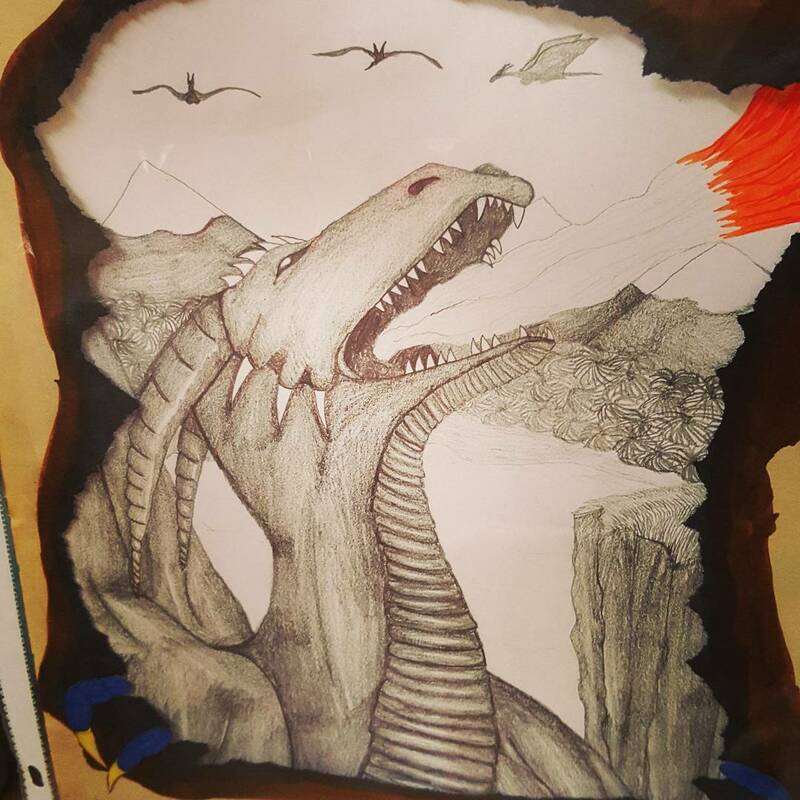 Along with sword fighting and book talk, the store had a contest for ‘Best Dragon Art” and the winner, Ruth, drew an outstanding dragon! 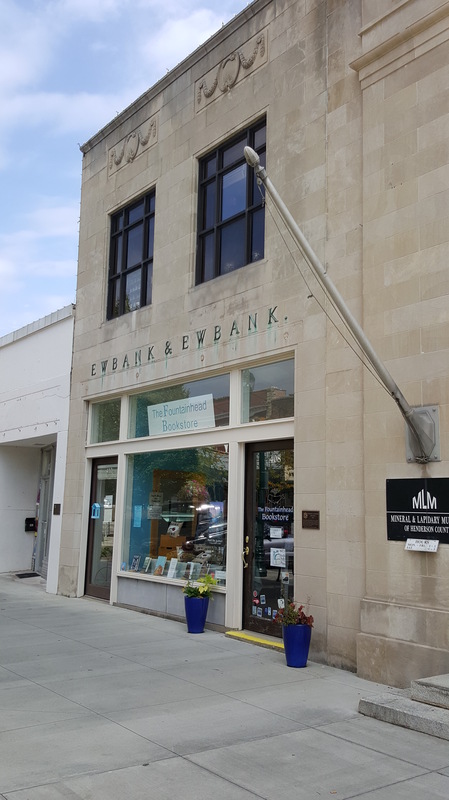 If you’re in Hendersonville, make sure to stop by The Fountainhead Bookstore (soon to be Novels and Novelties) for cool books, great people, and neat gifts. 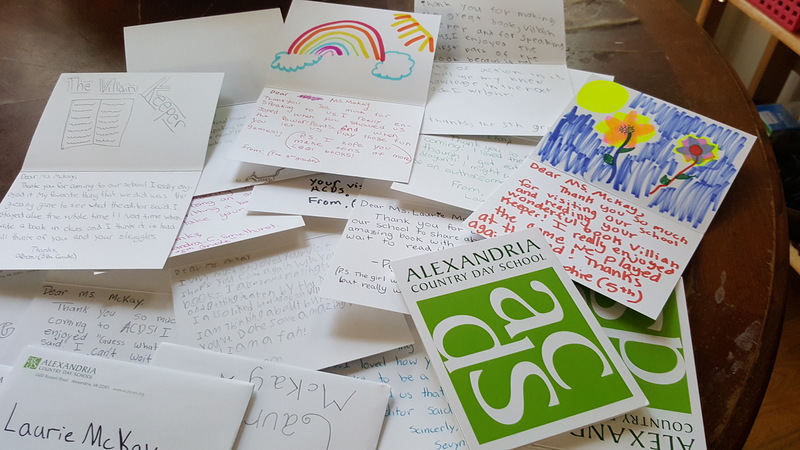 This week I went to visit two great schools – Asheville Middle and Joe Eblen Intermediate – in Asheville, NC. 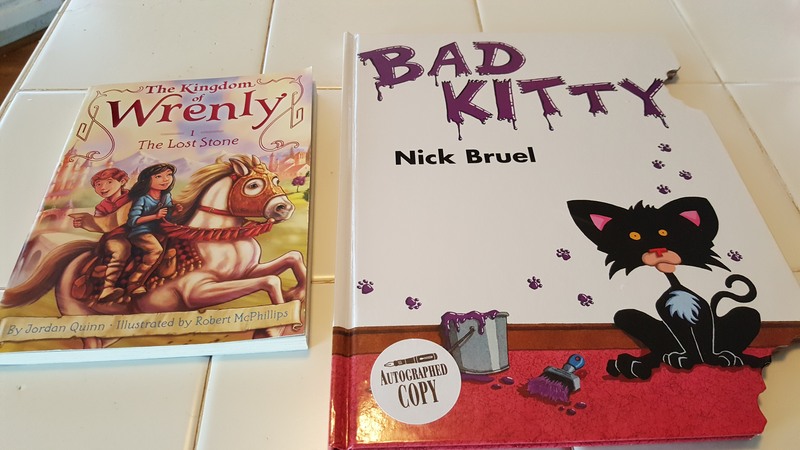 Then, on Saturday, I met up with Constance Lombardo, author of Mr. PuffBall, Stunt Cat to the Stars, for the Day of Signings Event at Malaprops Bookstore. All and all it was a great weekend! 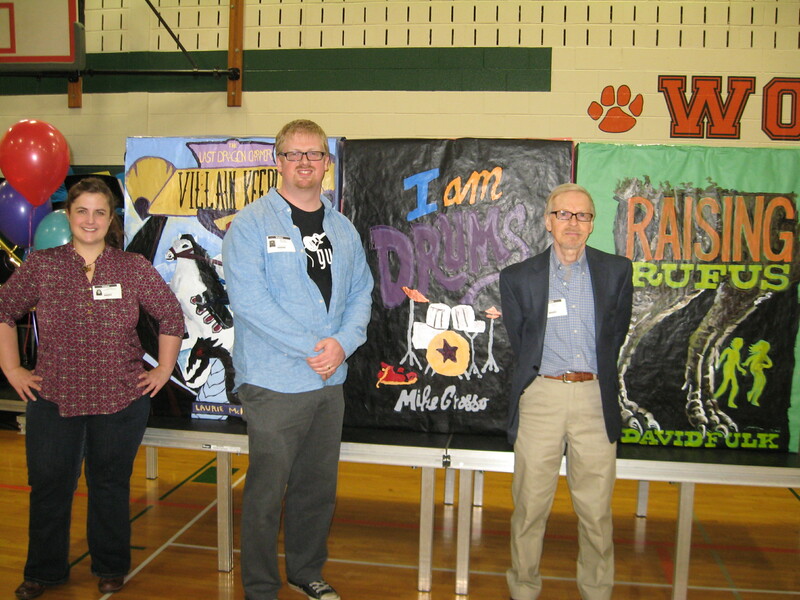 Last week, I visited 6th and 7th graders at Timber Ridge MS in Plainfield, IL and at Fischer MS in Aurora, IL with my fabulous fellow Fearless 15er fri ends and authors David Fulk (RAISING RUFUS) and Mike Grosso (I AM DRUMS). Anderson’s Bookshop set it all up for us! 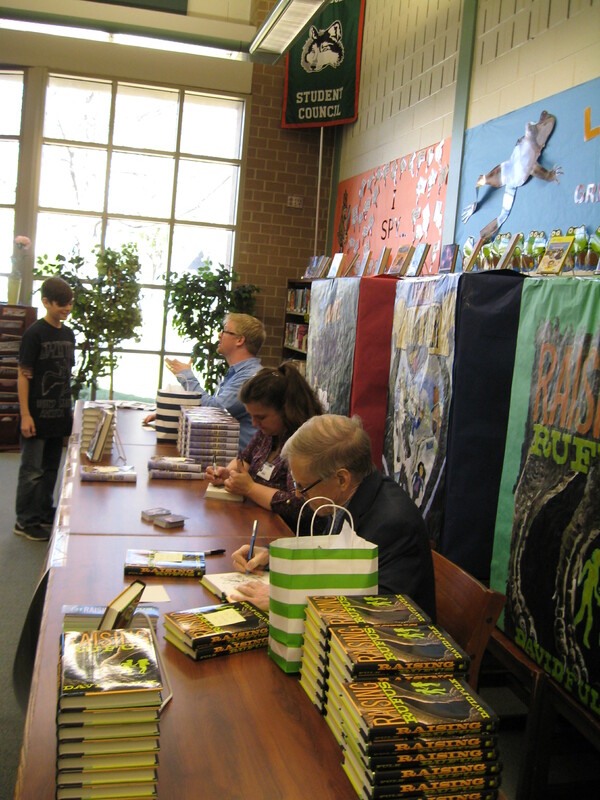 This was the first author visit I’ve done with other authors. Usually, before these visits, I’m excited, but also nervous. I have to find the school, find whoever I’m going to meet there, and then present my program – all on my own. Although I was still excited, still nervous, it was nice to share the stress and the spotlight with friends. And I *think* we put on a good program for the students. At Timber Ridge, the students had made posters of our books. It was amazing to see the giant cover art posters. They also had a band playing at the beginning of our program. Afterwards, several students came up to us in the halls to talk about our books. It’s just great to see kids excited about reading. After Timber Ridge MS, we visited Fischer MS. We got great questions from the 7th grade class and then got to chat with some of the 6th grade library shelf helpers. It was a great day at two great schools. 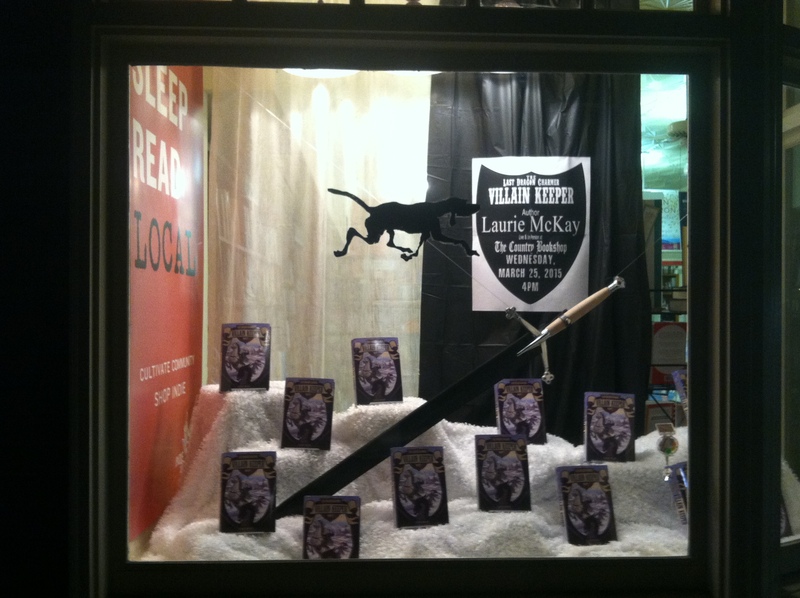 On Saturday, we had an event at Anderson’s Bookshop in LaGrange. The booksellers gave us a warm welcome and we got to chat about our books and read to a nice group of kids and adults.